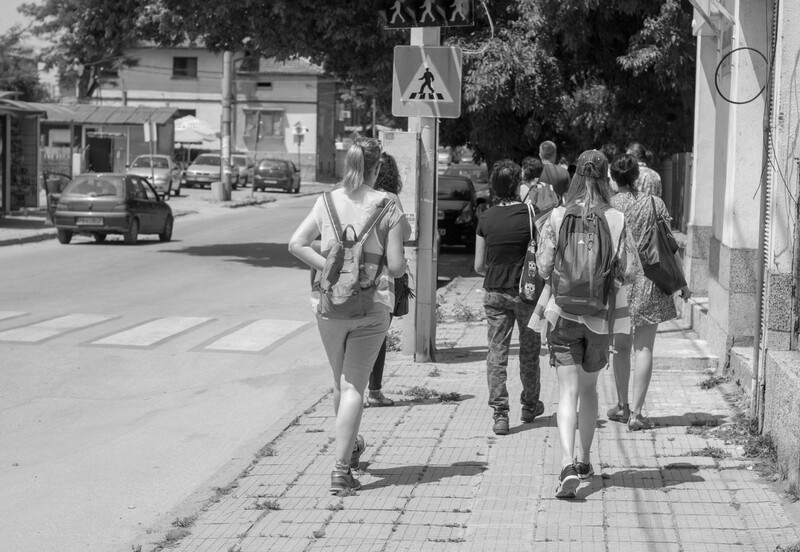 In June 2018 Bulgarian Fund for Women (BFW), together with the Paris organization Womenability, Gender Alternatives Foundation, Association “Consultancy Bureau Progress 7” organized four exploratory walks in two of Plovdiv’s neighborhooods – Proslav and Trakiya under its project “Sense of a City : inclusive, safe and sustainable Plovdiv”, part of the program of Plovdiv – European capital of culture 2019. In this article we introduce you the the sensations and experiences of women and men in the city: how their surroundings make them feel, which problems in their neighborhood they consider of as the most serious and how do they suggest to solve them. Within the BFW’s project we demonstrated the “exploratory walk” method and how it could be used at a local level to influence decision-makers and initiate changes and improvements in our urban environment. Due to the specifics of the method, 2 of the walks were women-only and two were open to everyone. During the walks, the participants had the opportunity to observe the neighborhood with fresh eyes and to assess what they saw in terms of five different topics: sensitivity (how they perceive the neighborhood through their five senses, what they like and what they do not); mobility and transport; family and love; security; and activities in the city / neighborhood. Almost 100 people, 67 women and 30 men participated in the walks. There were representatives of all kinds of different groups: people with disabilities, of different sexual orientation, parents with young children, elderly people, clients of shelters for victims of violence, youths. All volunteers participated actively both during the course of the walks and in the four discussions after them, which were an important part of the entire process. Different problems were identified for the two neighborhoods during the walks and discussed afterwards. Major problems for both Trakiya and Proslav were: broken sidewalks and streets, garbage and the lack of trash cans and containers, homeless animals. The availability of nature and plant life has been positively evaluated, but not the lack of maintenance. Along with the badly paved streets and the shortage of pedestrian crossings, another factor pointed out as influencing the feeling of safety (especially for women) was the lack of enough street lighting. In terms of security, harassment and street violence, more than half of the female respondents have been victims of verbal harassment monthly, around 40% have been an object of physical or sexual harassment (usually on public transport or in underpasses) and more than 1/3 have been followed by a man they don’t know at least once in their life. In the “family and love” category it was quite apparent that the two neighborhoods have not been adapted to the needs of parents with small children. Again, the poor state of both sidewalks and the streets posed a problem for people with disabilities, the elderly, parents with baby strollers; another problem was the lack of benches and special places for breastfeeding and changing babies, as well as the decrepit state of children’s playgrounds. You can familiarize yourself with all the results in detail in the specially prepared analyses: HERE for Proslav; and HERE for Trakiya. The results: the participating citizens of the two neighborhoods were motivated to look for creatives ways to improve public urban space and to be more involved in coming up with effective solutions. Moreover, they had fun and met new friends. Thus, they had the opportunity to find out about other people’s experiences, to share their own and to be ensured that their needs and recommendations would be heard. The exploratory walks were carried out within the Bulgarian Fund for Women’s project – “Sense of a City: an inclusive, safe and sustainable Plovdiv”, which is a part of the program of Plovdiv – European Capital of culture 2019 in partnership with, Gender Alternatives Foundation, Association “Consultancy Bureau Progress 7” and Womenability. The projects offers a grass roots model for sustainable development, where the citizens are empowered to identify problems and suggest solutions for improving the urban environment.